Should we stay or should we go? Responding to Ning’s new pricing plans. Visit the #smchat room on Tweetchat to participate in Wednesday's Twitter chat. #smchat meets weekly to discuss various social media topics. What do we do when a resource disappears, or changes in such a way that we need to reconsider our options? That is the question many of us are facing in regard to Ning, the social media service that let's you create your own social network. I'm currently a member of over a dozen Ning Networks, have created 4 and also have admin privileges on 2 created by others. So the Ning question affects me both as a user and as a developer. Today I'd like to ponder how we prepare for service changes, how much we rely on external systems and related topics. I don't have all the answers, to this so I'll give some examples and pose some questions, but I expect that it will be your feedback that really helps us make decisions about services such as Ning. I'll also be asking these questions tomorrow, May 5, 2010 at 1:00 p.m. (e.d.t.) via #smchat, a weekly Twitter chat on social media. Please feel free to share your comments here or during the live chat. Q46A*: What should we consider when a service changes or goes away? First we panic. Then we recall that the Hitchhikers Guide to the Universe says "Don't Panic." So we calm down and think about the issues at hand. If the service is going away we need to examine our goals and determine what features we need in an alternative site. If the service is changing we must still examine our goals and consider whether or not the changed site will be able to accommodate them. 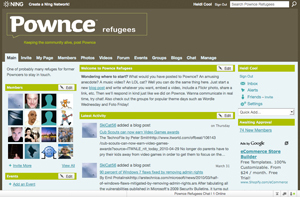 Back in 2008 I learned that one of my favorite social media services, Pownce, was going to shut down on December 15. In the frenzy to stay connected with Pownce friends, we rushed to explore other options, I created Pownce Refugees on Ning, others built their own sites, and soon we each had accounts scattered on services ranging from Soup to Vox. You can read more about this experience in my post, Social Media is People (but more enriching than Soylent Green*). I'm a Web developer, so I could have built something from scratch, but I chose Ning to host Pownce Refugees because it was something I could do quickly enough to spread the word via Pownce before the shut-down occurred. While it didn't offer the same feature set, it offered enough options that we could continue to have the types of long conversations and media embeds that we'd grown used-to. Within a short period of time we had 100 members, and we were featured in the Ning Blog post, Former Pownce members find a new home. The site served as a useful home base, but over time it became less active. Now most of us communicate (with each other) primarily through Twitter, simply because it was the one service that everyone was already using. We missed the functionality of Pownce, but at least we were all on Twitter. The heart of a social network lies in it's members. Ning, Vox and the Pownce clone, Schmownce (created by a fellow Pownce user) offered more features than Twitter, but they didn't have the same user base. Everyone (in our circle) was already on Twitter so it won simply because the people were already there. Other sites won as well. In an effort to make sure we wouldn't have to scramble again if Twitter died, many of us also friended each other on Facebook and other services so we'd have redundant connection points in play. Q46B: The costs of maintaining community: remain on Ning or move. How many members will we lose if we move to a new network? Will there be exporting and importing tools available to help us migrate users to a new service with minimal attrition rates? Small networks such as #smchat may find it easier to transition to a new service than would larger networks. How much content do we have on the site? Does it exist in multiple formats? Is there a way to cleanly export it so that we can also easily import it to another site? Or will we have to download and copy our content manually? Ning plans to provide us with tools for migration in the future, but we don't as yet know how they'll work. Can we, as site owners, afford the cost of an alternative plan? Ning's most expensive offering is $49.95/month. Or you can save a bit by paying $499.95 for a full year. While that will seem expensive to many, it's far cheaper than hiring someone like me to build a WordPress/BuddyPress alternative. If you have the skill set to build your own network, that may save you money, but you'll still need to invest your time. 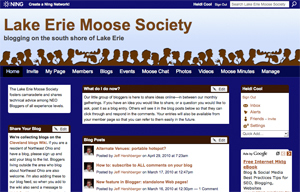 Our Lake Erie Moose Society is thinking about WordPress, but we're a blogging group, so we were planning to create such a site for people to experiment with anyway...and we have several members who can contribute to the project of building the site, so I won't have to spend as much time on it as I would if building it by myself. What other free options are available? Posterous announced that it would work on building an import feature so that Ning users could transition to that service. The features are quite different, but such options might be worth considering. One of the options mentioned for #smchat has been to use a group Wiki. What other options should we consider for #smchat and/or other networks? Q46C: Knowing that free services may disappear, is it worth it to rely on them? Or is it safer to stick with sites we build ourselves so that we don't become dependent on others that may not always be available? I think this really depends on the needs of your network. I can build my own sites, but I've still created Ning sites because they save me time. I don't use them for everything but the feature set and ease-of-use has made Ning a useful option. Building custom sites costs time and money, so I think we need to evaluate the risks and rewards of using platforms like Ning on a case-by-case basis. Q46D: What opportunities does the elimination of free Ning networks offer to others? Posterous announced they will be building a Ning importer. WPMU has announced a Ning to BuddyPress importer plugin. I plan to experiment with WordPress and BuddyPress so that I can build networks for those seeking self-hosted alternatives. It's too early to tell how/if Ning's plans will benefit Ning users and the company, but it also creates an opportunity for others to reach out to Ning users with alternatives. Movable Type, for example, could try to gain more customers by offering importing recommendations to Ning users who might want to use Movable Type with Motion as a Ning alternative. Who else can benefit from this change? What should they be offering current Ning users to entice them to user their service instead? As of now I've not decided what I'll do with each of my Networks, though I expect to keep at least one on the Ning platform. Each has different user needs that may be served with differing alternatives. We'll also be learning about more options in the weeks to come. What about you? What would you plan? *On #smchat we number the questions by session. Tomorrow's chat will be our 46th, thus I've numbered my questions as 46A-46D. We had great participation during today's #smchat about Ning. I've posted a follow-up to the chat, including a copy of the chat transcript, on the #smchat Ning site under: Q46: What to do about Ning? We all know these blog posts don't get written as frequently as I'd like. But that doesn't mean you need to go weeks without hearing me babble. Over on http://www.facebook.com/heidicool, I'm sharing one tip per day, usually as a short paragraph with a link to something interesting I've found in the blogosphere. I think it is illusory to think we can exist independent of some kind of system, but hosting on a free service surely has to be at one end of a scale of which the other end is to be hosted on a commercial web server using a paid-for package. Except, in the case of a Ning alternative, what would that package have been? At the time Ning started, I don't think there was anything else on offer and I am not sure there is now. If I wanted to start a community, I can only think of vBulletin as an alternative. I just did a quick trip around three of the forums I visit, and they all use vBulletin. David, I think you're right. We're all dependent on something, whether that's software, our hosting provider, or whatever. A lot of the communities on Ning wouldn't have existed but for the fact that Ning made them possible. Or they would be using something simpler with fewer features. 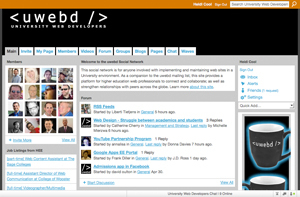 The University Web Developers site, for example, evolved from a listserv. But Ning gave the group a much more useful platform on which to share and archive their thoughts. vBulletin and discussion boards are also a common alternative. We might also have used things like Usenet newsgroups in the past. I can't think of anything else that would have been as robust as Ning at the time it launched. I think the fact that it filled such a useful niche was what drove millions to create networks on it. There are now various Ning-like sites (at varying price points), but before Ning, one would probably have needed to roll out a custom site at a cost of presumably 10's of thousands of dollars. (Given the programming involved for the various features.) Ning made it possible for many of us to create things that would otherwise have been beyond our means. Yes, you make a good point that people form communities when there are the applications in place to enable them to do so. Meanwhile Posterous is having problems at the moment with distribution to Europe because of a problem with the servers on the Cogent ISP. That can happen with any site of course, and I am sure that the ISP is working hard to resolve it, but Posterous (like Ning) is an example of the kind of site where the end-user could not simply move to another web host. I am intrigued: What Ning-like sites are out there? David, I found http://www.groupsite.com/ yesterday when I was researching things for this post. It looks like it has similar features. They have a free plan with limited features then 3 pro plans (more pricey than Ning's new plans), and can create custom pricing for larger sites. Group Site's large plan is $99 a month but only supports up to 300 users so anything bigger requires a custom plan. I didn't really dig into all of their features, but that makes it far more expensive than Ning, so they'd need a very robust feature set to justify the cost. This may be meant as more of an enterprise system than a tool for communities and non-profits. I know a lot of people are not happy with Ning right now and are looking for alternatives. Unfortunately for many groups they are just going to have to pay it as switching to a new platform has a lot of risks. I wanted to post a couple other solutions for developing social networking sites. There's Dolphin 7 from http://www.boonex.com and the PHP-based Social Engine http://www.socialengine.net/. Obviously, these require development and coding, but if you don't know how to do it yourself, these solutions can help lower outsourcing costs. Nice blog Heidi! CodeMyConcept, I appreciate the confidence. Alas time is always an issue. Client projects come first so there isn't always enough time left to build out all of the other things on my list. I probably will do something for the Lake Erie Moose Society though. Now that WordPress 3.0 is out it will give us a chance to do some experimenting, and a few people in the group have already volunteered to help. 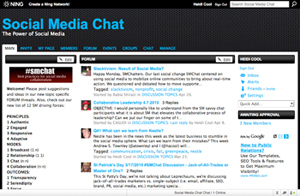 I need to chat more with @sourcepov about the #smchat site and what we'll decide for that. Tommy, I've heard about Dolphin but haven't used it. Social Engine sounds intriguing as well. Thanks for sharing those! It really frustrates me to have put in time and effort building a ning-network and now beeing forced to pay for my work. I'm seriously looking for alternatives to move my content to another FREE network. luckily this article gave me some valuable input for my search. « Dust off those pixels: your Web site may be due for spring cleaning.